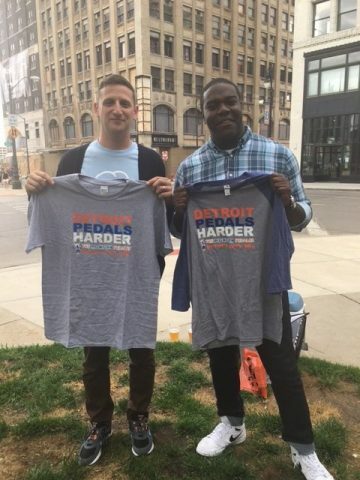 Comedy Central's Detroiters stars Tim Robinson (left) and Sam Richardson (right). The two showcase their Michigan Pedaler t-shirts after spending two days filming on the bike in July 2016. That is a question I am frequently asked once the build-up to the series premier landed on people’s radar and The Michigan Pedaler appeared in its trailer, racing onto a highway and raising the anxiety levels of series stars Tim Robinson and Sam Richardson. Well, the quick summary: fun, cool, long, boring, exciting and memorable. 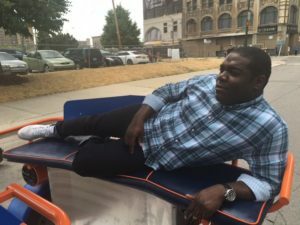 Detroiter series star and Detroit native Sam Richardson relaxes on The Michigan Pedaler during a break in filming. 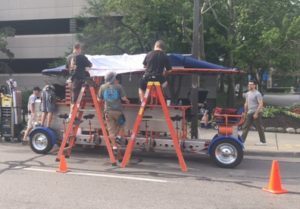 The Michigan Pedaler spent two days filming with the crew. But not that one would expect it to be, it is not all hi jinx and hilarity. The days are long and monotonous. But the days are fun and more than anything, it certainly is an honor to be asked to be part of such a production. How did we get picked? Of course, that is the million-dollar question. Before we even began formal operation, we read an article in January 2016 about Detroiters in the local newspaper. We shared the article on The Michigan Pedaler’s Facebook page. The Detroit Free Press article simply explained the premise of the series. In sharing the article, we noted that we could only imagine the fun that could be written into a script with the stars riding our bike. Did a VIP from the series notice that post and decide to incorporate us into the story line? Maybe. We’ll never know. One day, as I was nearing the end of a long day at my office after 7PM, the phone rang. A deep-voiced man named Robert introduced himself as a Unit Production Manager for the show and asked if we would be interested in participating. Of course, we were very interested! Phone calls continued and the date of the actual filming of our scenes solidified. A number of staffers met with me and the bike to measure it, snap pictures and figure out exactly how some things would work. Knowing that I have a face best-suited for radio, it did not surprise me that the script called for the driver to be hidden from view. Thus, they spent a lot of time figuring out how to build a box around the driver of the bike, yet still insuring that I could drive, steer, brake and create a completely safe experience for all. Finally, the days arrived for The Pedaler to film its scenes. They were hot, humid, and one day included a threat of rain with some touch-and-go sprinkles. Temperatures on these early-July days hit into the 90s. Early on July 7th, we arrived west of Joe Louis Arena and next to the entrance of the Riverfront Apartments. This would be home for the next eight hours. Staffers began examining the bike and determining how all the cameras and equipment could fit on the bike for the shoot. 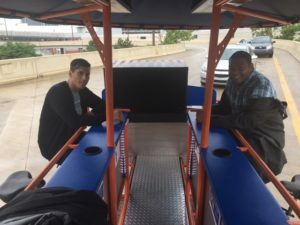 Staff on the set of Detroiters prepare The Michigan Pedaler for a shoot. All set and ready to go. And then dead time. 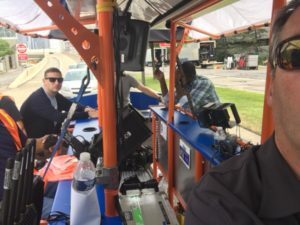 One of our drivers lives in the Riverfront Apartment so he came down to visit for a while as the two stars, Detroit native Sam Richardson and Clarkston boy Tim Robinson filmed a scene in a small park. Soon after, the Pastor at Corktown’s nearby Most Holy Trinity church stopped by to see what was going on. While we conversed, another Pedaler driver who lives in Corktown came up to say hi on his bike. After introductions were made, a vivacious conversation ensued with a great deal of laughter, including hearty bellows from the Pastor. A sound man quickly approached the three of us even though we were a street crossing and more away from the filming. It probably helped that one of us was wearing black. We continued our conversation with less decibels – and also less humor to avoid laughing. A part of the episode involves some wrong turns that gets everyone in trouble. 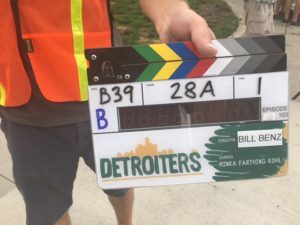 The city of Detroit shut down an exit ramp of the Lodge Freeway to facilitate the filming of one of the scenes. What you learn is that a scene must be shot many times to capture all the potential angles. There are shoots to capture dialogue. There are shoots to capture perspective from a distance. There are shoots to capture one side of the bike. There are shoots to capture the other side of the bike. And there is the old adage that what goes up must go down. So for each shoot that the bike took whisking down the exit ramp, the bike had to reposition itself again by going up the exit ramp – which is pretty steep. Since our bike comes equipped with electric assist (subtle hidden commercial), going up the hill was not a big deal. However, turning the bike around on an exit ramp (reverse means using your muscles – or in this case, Detroiter team members’ muscles) is not the easiest. So, to get the bike perfectly positioned and turned around on a narrow exit ramp (with a slope no less), takes a bit of work sometimes. The crew did it effortlessly. To film a scene down an exit ramp even required the use of stunt doubles matching the clothing and looks of series stars, Tim and Sam. It is scary how closely they resembled them.There were also stunt car drivers used in cars to create a traffic scene. Is this series stars Tim Robinson and Sam Richardson? No, it’s not. It is their stunt doubles! The producers all spoke about how everyone’s primary concern in shooting these scenes would be safety. Thus, we carefully applied a brake while barreling down the ramp as we shot the scene. As I sat in my beautiful non-air conditioned box, word came through the walkie-talkie to let it go just a bit faster. I did as I was told. But maybe just a little bit too much. As we hit the bottom of the ramp and I pulled over to where I was told to stop to end a scene, I heard a number of expletives come through the walkie-talkie. I heard complaints being hurled. I figured someone screwed up big time. I wondered which stunt car driver did something wrong cause everything seemed to go just swell on my part. Then I realized that person is me. After things calmed down a bit, the directors believed I took the hill a bit too fast. Next time, make it a little slower. Or a lot slower. Detroiter series stars Tim Robinson and Sam Richardson rehearse on the bike surrounded by filming equipment. Besides these high-drama moments, the rest of the day simply clicks along. Set up of the bike with cameras and equipment to shoot one scene can easily last 90 minutes. To get the lighting correct, sometimes our canopy needed to be removed and replaced with other lighter coverings to help with shadows as well as light. I jumped in a van at one point and headed to the Masonic Temple where the cast and crew sat in a room and partook in at a buffet lunch. An average NFL game lasts 3 hours and 12 minutes, but if you tally up the time when the ball is actually in play, the action amounts to a mere 11 minutes. It is kind of like that with filming scenes. The Michigan Pedaler “clocked in” for over eight hours. If you added up the amount of time we actually were rolling tape, it probably is about 10 minutes. And my guess is that those 10 minutes from day one will result in less than a minute of show footage. In realizing all of this, I chatted with a crew member about the long amount of time it takes to film a very short scene on The Pedaler. I noted though that there are a lot of moving parts and a lot of sequencing. “So to make up the difference, do you just go to a restaurant and shoot a table scene where they talk back and forth a lot and you can film that a lot quicker,” I questioned. Day two proved to be a Chamber of Commerce day in the Motor City. A hot sun, blue skies and a sparkling city core proved to be ideal. As I walked around the set-up, you could see some of the attention to detail for even small touches that never would make it to screen. For instance, cast and crew could mosey on by a tent and table filled with snacks and drinks. Each day the offerings always included Detroit-centric foods like Faygo pop or Detroit Bold Coffee. Our shoot for day two proved to be a bit shorter. We were filming a drive down Park Avenue at Grand Circus Park. I tried my best to keep the bike moving at the right pace and turn at the requested angles to accomplish the shot. When the words “Action” came through the walkie-talkie, I would move the bike as directed. On one shot, I heard the word “Action.” I hit the electric assist pedal slowly as instructed. 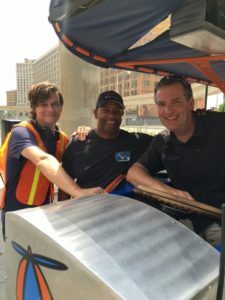 Michigan Pedaler owner Mike Gill between Detroiter stars Tim Robinson and Sam Richardson. The bike did not move. I hit it a little harder. The bike still did not move. Panic began to set in. Did the bike break? Why is it not moving? What is going on here? “Action” again came across the walkie talkie. “It’s not moving” I replied. “Check the emergency brake,” I heard Robinson yell out from his perch on one of the pedal seats. I took the e-brake off. We moved. But now the scene needed a reset. I looked through my rear-view mirror to see a smile on Tim’s face, while shaking his head in disbelief. No other words needed to be said. My Bosses: Detroiter Director Bill Benz and 1st Assistant Director Scott Harris. 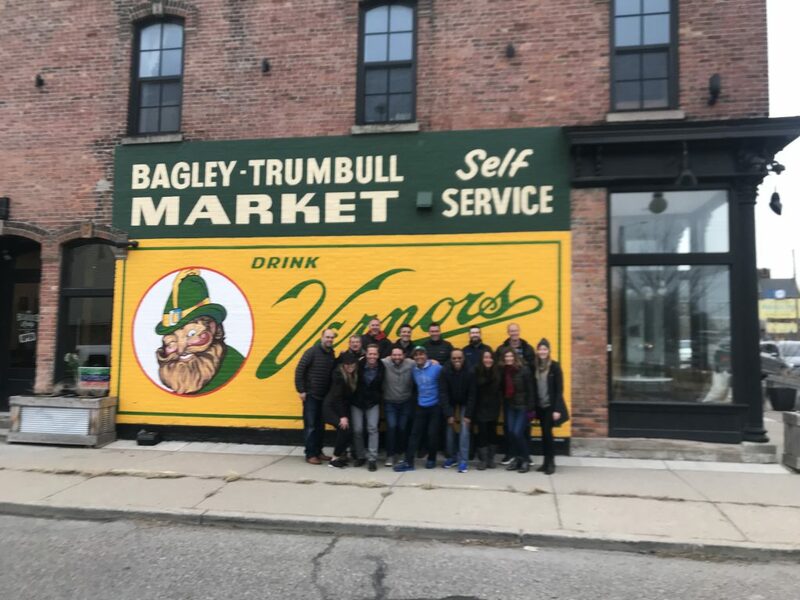 As The Michigan Pedaler wrapped up its part in the filming, all ended well. We received thanks from the cast and crew, thanks for dealing with sitting in a wooden box, and best wishes as it was time to move on. Sam and Tim chatted for a bit and of course, agreed to the obligatory picture. 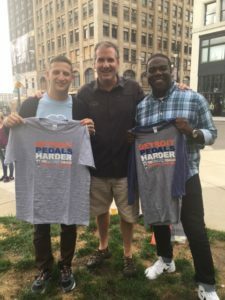 They held up their own Michigan Pedaler t-shirts stating “Detroit Pedals Harder.” I joked that this picture will probably cause a run on these shirts (subtle commercial message). 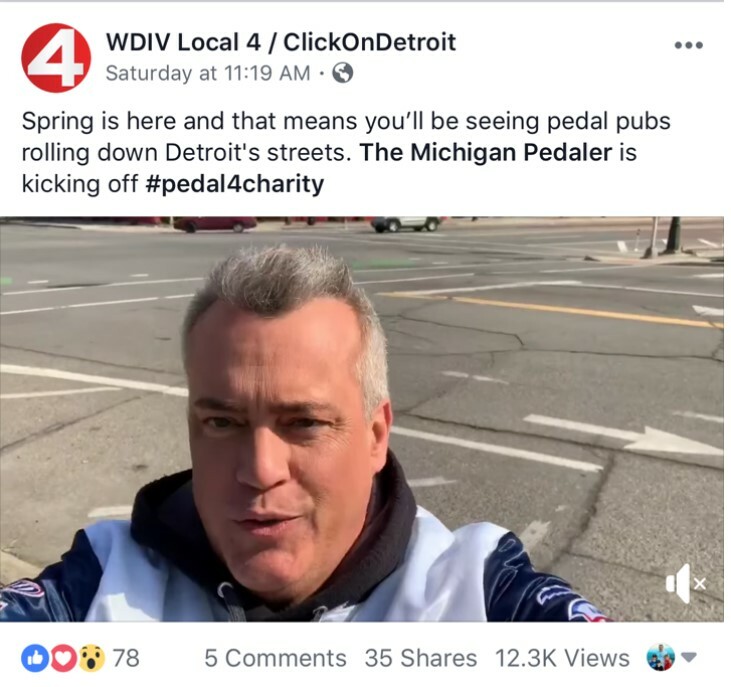 On March 14th, The Michigan Pedaler will make its national TV debut as it appears in that night’s episode of Detroiters on Comedy Central. It is sure to be one of TV’s finest moments. About the Author: Mike Gill is the owner of The Michigan Pedaler who forgets to remove the emergency brake.